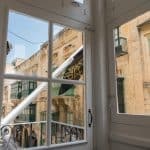 Look out on the beauty of Valletta from the comfort of your own private balcony. 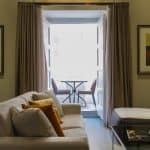 At Palazzo Jean Parisot, our Balcony Suites provide you with a viewpoint onto the charm of this very special city. 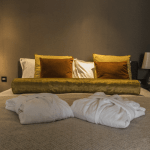 As with our other suites, your Balcony Suite guarantees the utmost comfort for your stay, with a luxurious Hypnos double bed adorned with top-quality Frette linen. 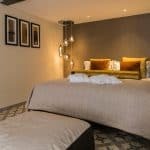 Here your space includes a comfortable sofa bed for additional guests, a fully-equipped kitchenette, dining area, coffee machine, hairdryer, magnifying mirror and in-room amenities. Your Balcony Suite also provides state-of-the-art technology by way of a SuitePad, which will give you up-to-date information on the property, special offers, restaurant recommendations, activities and more. Beyond that, you can enjoy the TV in the bathroom mirrors and the Smart TV in the bedroom. We look forward to welcoming you to your Palazzo Jean Parisot Balcony Suite.